In 2010, Edward Cayley went for a drive with his son David, and David's wife Jutta. He showed them all the places where he or his near family had lived, telling them a few stories connected with those houses. Then in August 2012, Edward died, at the age of 90. Obituary. It's nice to have these recollections. And posting them prompted a bit of a google hunt that resulted in more material that one would expect. Those links are listed below the photos. 1. 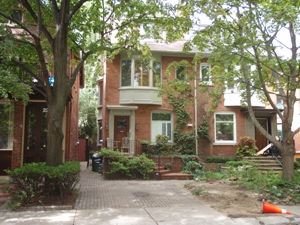 35 Rosedale Roard. 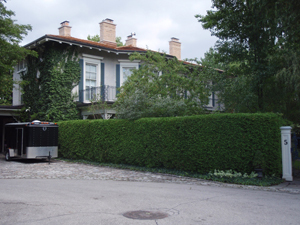 In 2010 owned by Harold (Hal) Jackman. "You can see the upstairs window of the room where little Tony Wittingham got injured at a ball hockey game (one of us was using a golf club to play ball hockey). He was taken to the hospital to have his lip sewn up -- the scar was there all his life." 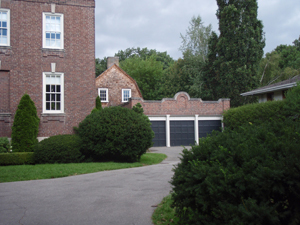 Two bedrooms and a bathroom were added above the garage, which is where Edward and Peter slept -- 1926 or 1927 to 1931. 2. 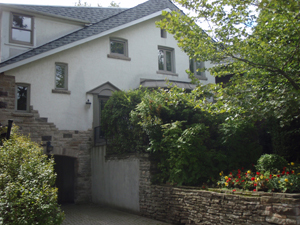 95 Crescent Road. Designed by architect Ford Howland (who also designed St.Anne's Church) for his cousin Katherine Howland (Nan), Edward's grandmother. Ford Howland was grateful that she gave him the commission, since nobody wanted to hire an architect in the depression. She lived there from 1932 until her death in 1954 or 1955. 3. 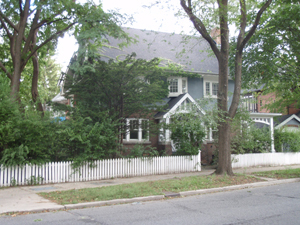 The house that Alice Cayley rented at Elm Ave. and Dunbar Road after her husband Edward died. When she left there, she lived on Howard Street (that house is gone). 4. 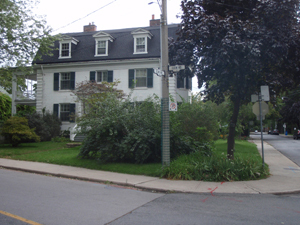 67 Glen Road. This house was built by Peleg Howland and his wife Katharine around 1908, a bit before Peleg became the president of the Imperial Bank. Katharine was born on Huron Street. Peleg died in 1930. Even when he was the bank president, he used to bring his lunch in a paper bag and stand on the Bathurst Street railway overpass to watch the trains go by underneath. Edward could remember standing there with him. 6. 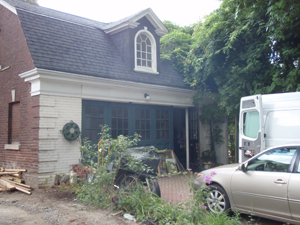 The garage of 67 Glen Road. Reeves, Nan's chauffeur, lived above it, until he moved into his own house on Rose Ave. When this picture was taken in 2010, an artist had his studio in that room. 7. Nanton Ave (duplex on left). 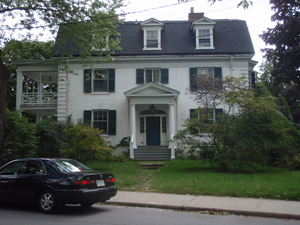 This is the first house that Edward remembers, although the family lived on Broadview Ave. when he was born. They moved from Nanton Ave to Rosedale Road in 1926 or 1927. 8. 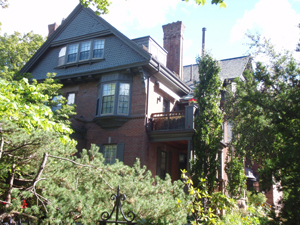 The Gerald Lankin House, now Thompson. The coach house (around the corner out of sight) was made available to Alice and Ray -- they were there when Edward returned from the war in 1945 and Alice died there in the spring of 1951. A feature of the drawing room known to travellers like Sir James Alexander in 1847 was the mural decoration representing scenes from Faust in sgrafitto -- drawn, we are told by Sir James, 'with a bold and masterly hand by the proprietor.' A recalcitrant fireplace gives a certain realism to the damnation of Faust, whose features appear strangely through the murk. 11. The St.Simon's Rectory. It used to be around the corner next to the church, and Ray was born there. But Edward never knew it in its old location. The entire house was picked up and moved around the corner to Glen Road. 12. 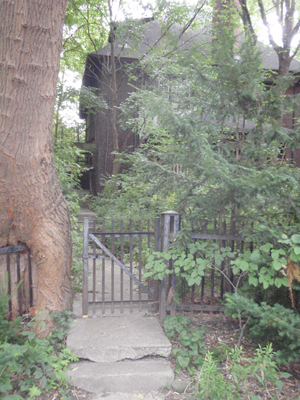 The crooked entry gate to the St.Simon's rectory, with a tree trunk grown right into it. 13. 170 Inglewood Drive. 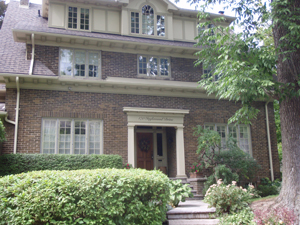 That was the house Arthur and Katharine moved into after they had to sell Rosedale Road (1931 or 1932). They lived there for a year before they over to South Drive. There's no picture of the 22 South Drive house. 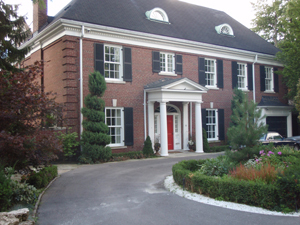 It was expropriated for a new Rosedale School playground and then for the Mount Pleasant extension, in the 1950's. 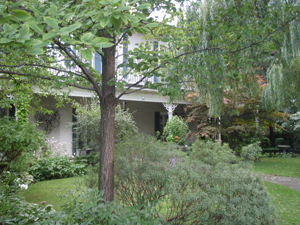 After the expropriation of the South Drive House, Arthur and Katharine moved to Foxbar Road. 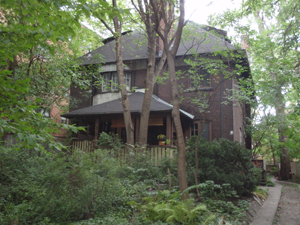 That house was also expropriated, to widen Avenue Road. So they were expropriated twice! 14. 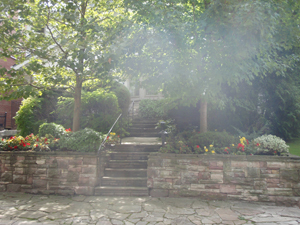 The stairs up to the Ridge Drive house where Arthur and Katharine moved after they lost Foxbar Road. 15. 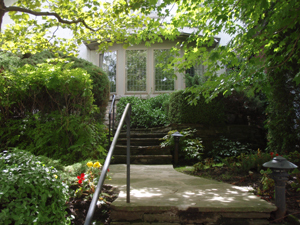 The stairs up to the Ridge Drive House. David remembers the railing. earlier ancestors back to 1100. Cayley website of Michael Cayley, who says he's collected over 5000 Cayley names since he started in the late 1980's. Good heavens! Lively stories. The work of mathematician Arthur Cayley is part of a high school math contest. When Luke was at Harbord Collegiate, he made a bet that the math contest was named after one of his ancestors. His friends, knowing Luke's marks in math class, bet that it was impossible. Luke won the bet, a giant bag of caramel popcorn. More on Arthur Cayley, with more math details and a Youtube lecture on Cayley's theorem. How to make quilt patterns using Cayley math: "Cayley tables". Cayley Hall at Roche's Point (Lake Simcoe). Mountains: Mount Cayley and in Wikipedia: http://en.wikipedia.org/wiki/Mount_Cayley Named after Beverley Cayley, a lawyer and mountaineer, son of Judge Hugh St.Quentin Cayley (descended from William Cayley).